Are Long Terms Results for Collagen Matrix Comparable to Autogenous Tissue for Root Coverage? Collagen matrix used with a coronally advanced flap was compared to a connective tissue graft used with a coronally advanced flap at 6 months and 5 years for root coverage achieved. Seventeen patients were available for the 5-year recall. Mean root coverage between 6 months and 5 years changed from 89.5% to 77.6% for collagen matrix and 97.5% to 95.5% for connective tissue. There was no significant difference between the therapies for changes in root coverage, keratinized tissue width, and probing depth. Patient satisfaction was similar for both therapies. Collagen matrix is a viable long term alternative to traditional autogenous connective tissue when used in conjunction with a coronally advanced flap for root coverage procedures. There is a trend for slightly better root coverage with autogenous tissue, but patients seem to prefer the lower morbidity of an allograft. Long-Term Results Comparing Xenogeneic Collagen Matrix and Autogenous Connective Tissue Grafts With Coronally Advanced Flaps for Treatment of Dehiscence-Type Recession Defects. This entry was posted in Uncategorized by Dr. Bassel Paul Gebrael. Bookmark the permalink. Clarithromycin Beneficial with Full Mouth Debridement in Generalized Aggressive Periodontitis? Emdogain plus Calcium Phosphate for Two-Wall Defects? Good long term results for tissue grafts? 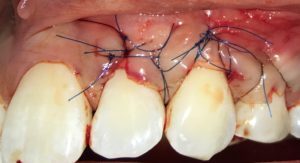 Platelet-rich fibrin (PRF) to treat periodontal intrabony defects? “Growth and Profit for Your Practice”- a Full Day CE Seminar on Sunday, November 20th, 2016 at the Trump International Hotel, 325 Bay Street, Toronto. full version games on What is the Palatal Mucosa Thickness on a CT Scan? ban chung cu vincity on What is the Palatal Mucosa Thickness on a CT Scan? Allan Hawryluk on How Successful is Peri-Implantitis Treatment? dr galil on What is the Palatal Mucosa Thickness on a CT Scan? Bassel Gebrael on Does Thread Design Influence Immediate Implant Positioning? ©2016 Dr. Bassel Paul Gebrael. All Rights Reserved. Illustrations used are courtesy of Straumann, Nobel Biocare, Biohorizons and Den-Mat. The opinions expressed in this website are those of Dr. Gebrael and contributors and not the aforementioned entities. The contents of this website are for informational purposes only and do not render medical advice or a professional device. Information on this website is not a substitute for comprehensive examination of your dental needs by a trained professional.